Guest: Dr. Robert Latkany (New York, NY), Ophthalmologist, author of The Dry Eye Remedy. Sharon Kleyne: Dr. Robert Latkany is a New York eye doctor (ophthalmologist) who devotes his entire medical practice to dry eye disease. Dr. Latkany, I know that dry eye symptoms are the most common reason for ophthalmologist visits. Tell us why, as a New York eye doctor, you decided to treat only dry eye. S: What are some dry eye symptoms? L: The main complaint is intermittent blurred vision. Also itching and burning eyes, redness, irritation, drowsiness, anxiety and increased sensitivity to allergies. Symptoms can be debilitating and scary. Our eyes are not well protected and a lot of diseases - both of the eyes and body - can enter via the eyes, especially if the tear film is unhealthy. Also, over 100 prescription drugs can cause dry eye, including allergy, thyroid, blood pressure and anti-psychotic medications. S: Dry eye symptoms can also affect the ability to concentrate. And numerous environmental factors contribute to dry eye symptoms. Tell us the effect on dry eye of forced-air heating and cooling, insulated walls and windows, household chemicals, and cleaning compounds. L: They can all cause dehydration of the eyes' protective tear film. That's why it is important to pay attention to our environment. In a car, brief attention lapses from eye discomfort could be fatal. And you may only need to crack a window or point the air conditioner vent away from the eyes to be comfortable. 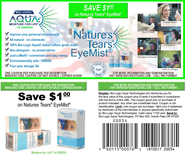 Or keep a bottle of all-natural Nature's Tears EyeMist handy. S: How would you describe your "mission"? L: To inform the public about dry eye's rapid growth, symptoms, and the consequences of not taking preventive measures. Dry eye affects all age groups but is more common over age 40. There's another spike among older teens and people in their early 20's, who tend to abuse contact lenses. When contact lenses are worn for too long, they deprive the cornea of oxygen and cause dry eye symptoms. S: On this program, we stress taking proactive responsibility for your own health. That includes educating yourself about vision care and looking up drugs online before taking them. L: I hand out a "dry eye checklist" at the end of each exam. Compliance, or following the doctor's instructions, is an issue in all branches of medicine. Nobody tells us to be sure to drink enough water when we take pills, but that can make a tremendous difference. S: Do you have any natural nutrition hints for good vision care and dry eye prevention? L: In my book, The Dry Eye Remedy, I recommend a diet including ?-3 fatty acids, certain specific foods and plenty of water. ?-3 fatty acids occur in dark, oily fish and in cashews and almonds. Carrots are great for the retina but do not correlate with dry eye. S: Where can listeners get your book? L: Go to www.dryeyeremedy.com, amazon.com or any bookstore. .
S: What do you recommend for computer eye irritation, which is a form of dry eye? L: Raise your chair so you're looking slightly down on the screen and don't keep your eyes opened as widely. Also, take a break every 15 minutes or so and arrange the break so you're not staring at the screen. Also, sip water as you work, keep an open bowl of natural water nearby to humidify the air, and keep Nature's Tears EyeMist nearby and use it frequently. It's also important to get plenty of rest at night, when your eyes recover from the strain of staring at the computer. S: What else can you tell us about dry eye and sleep? L: Eight hours is best and productive, uninterrupted sleep is ideal. Again, drink plenty of water and keep an open bowl of water by your bed. S: Is it OK for children to use computers? L: Yes but not for several hours a day.